With the StarWitness® Interviewer you can stream a live interview right to your desk. The user-friendly web interface makes it easy to view live interviews, view previously recorded interviews or share interviews with anyone on your network. Export to DVD, USB, or external hard drive. Monitoring station displays exactly what is being recorded. Records up to 1000 hours. Archive of all interviews are held on the system. If a DVD disc is scratched or otherwise damaged, just go to the system console and burn another one. Bookmark specific points in an interview for later reference. Export to DVD or USB thumb drive, no proprietary software needed for playback​. Pause and seek in an active recording just like a TV DVR. Play back or burn recordings while recording an interview. User accounts to protect against unauthorized access. Each interview is logged and tagged with an owner allowing users with administrator access to easily analyze and verify the chain of evidence. ​Primary suspect-view camera and room-overview cameras: Dome cameras with vari-focal lens for adjustment of zoom and three-axes adjustment for setting custom position of the camera angle. High-resolution color camera with 700 lines at 0.0003 lux. Concealed room-overview camera: Smoke detector high-resolution hidden camera with realistic smoke detector enclosure including working red LED light. High-resolution color camera with 600 lines at 0.5 lux and 3.7mm focal length for wide angle overview of interview room. Concealed suspect-view camera: Covert thermostat with high-resolution hidden camera. High-resolution color camera with 700 lines of resolution at 0.0001 lux low-light rating and 3.6mm focal length with 90 degrees maximum field of view. Remote monitoring of live interviews via web browser from any PC on your local network. Microphones: Two microphones wall-mount microphones, resembling light switches, provide stereo, low-impedance, balanced audio for clear audio recording without hum pickup or high-frequency loss even for long cable runs. 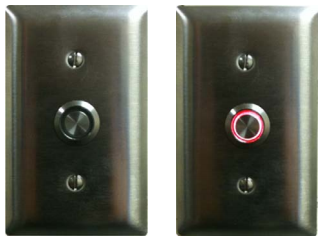 ​The system features two sets of indicator lights, one set in the interview room and one set outside the room. 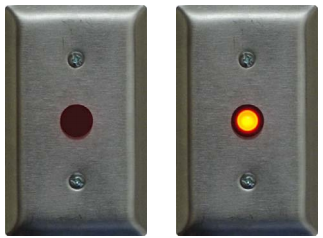 The In-room indicator light before the recording is started (left) and while a recording is in progress (right). Recordings can not be stopped using the push button on the indicator light. The push button is used to start a recording. In order to stop a recording, you must click the Recording Stop button in the Interviewer software program. Setting up your interview room is one of the key aspects for securing a good interview. Where will you place the cameras, microphones, and other components for recording? 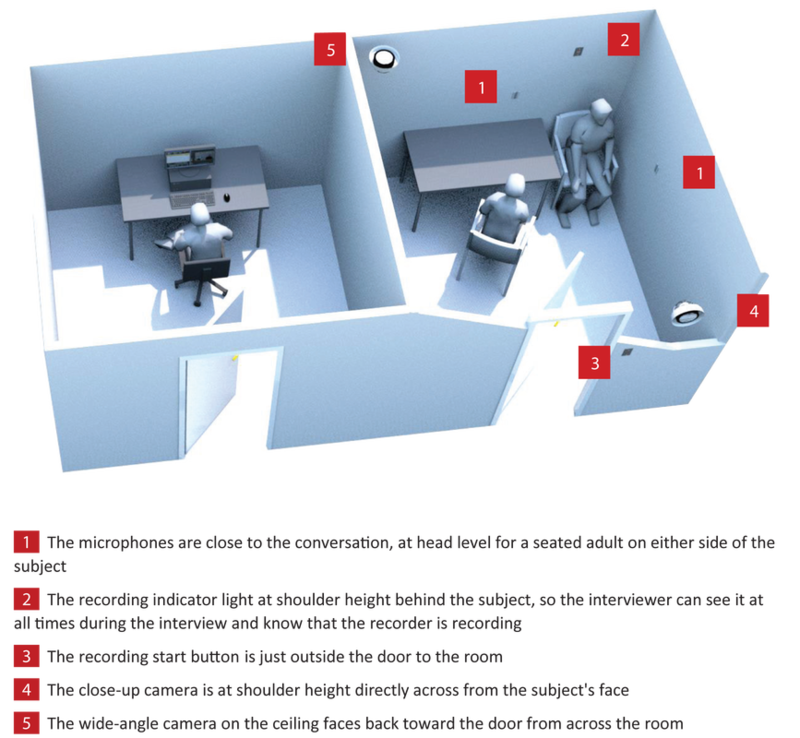 See below for an example of a room layout and check out our 'Getting the Most Out of Your Interview Room' guide. "We are extremely pleased with the Star Witness Interview system since we purchased it several months ago. We have conducted almost two hundred flawless interviews utilizing the system. It is extremely simple to use, with one button recording. In fact, several local police departments have asked us to utilize our system to assist them in their criminal investigations. I would recommend this system, and have several times, to any law enforcement agency looking for a simple yet complete system to record interviews for criminal investigations."